Orange County, located in the Research Triangle region, is defined by the town of Chapel Hill, and the town of Chapel Hill is defined by the University of North Carolina, the first public university in the state. The influence of UNC has long made Chapel Hill a bastion of higher education – and political liberalism. The county was one of two in North Carolina to be won by George McGovern in 1972, and has not been won by a Republican presidential candidate since Herbert Hoover’s landslide win in 1928. Inmigration from the rest of the country has reinforced the college town’s Democratic tendencies. While Democrats were always guaranteed over 60% of the vote, now they regularly carry the county with over 70%. And although there are still some red areas in the rural, northern parts of the county, they are growing bluer by the year. 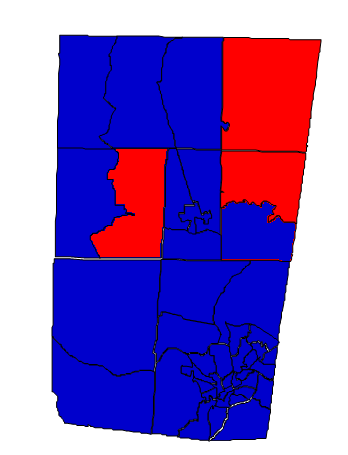 Orange County is also the site of Carrboro, probably the most politically liberal town in the entire South. Carrboro elected a gay mayor all the way back in 1995 and also adopted resolutions against the Iraq War and the Patriot Act. The county has the most liberal white population in the state. Obama won about two-thirds of the white vote in Orange County in both 2008 and 2012. Obama also carried the white vote in the counties of Durham and Buncombe. Prognosis: The growth rate during the 2000s was 13.17%. There was massive growth in both the Asian and Hispanic populations. From 2000 to 2004, the county saw a large shift to Democrats but has remained fairly stable since then. There are few bright spots for Republicans here, except for the hope that turnout from young people might decrease when Obama is off the ballot. Regardless, Orange is a deep blue county and will stay that way a long time.